Here’s the list for the week. 1 Spaghetti Squash This squash is literally “spaghetti squash.” Bake it in the oven at 350 degrees until you can easily pierce it with a fork–about 45 minutes. Cut open and after removing any seeds, you’ll see that when you scrap the flesh it comes out in long strings like pasta. 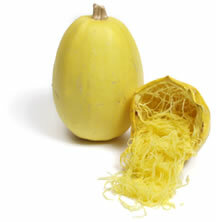 Spaghetti squash has a more delicate flavor, so you’ll want to spice it, add a sauce, or saute with other veggies. Greg Pusczek Farms, Marine, IL Greg farms on some land that is part of Mills Apple Farm. He is a part-time farmer who uses sustainable growing methods and mainly grows late summer and early fall crops. We use a lot of his greens in the dinner menu at the cafe. Deep Mud Farm, Auxvassie, MO Jeremy Saurage is young, energetic farmer who operates a certified organic farm. His produce is always top of the line! Bellews Creek Farm, Hillsboro, MO Paul and Nancy Krautmann are die hard organic farmers although they are not certified. Throughout the winter you’ll receive dried pinto beans, dried black beans and popcorn. He’s only about 30 miles from St. Louis which is pretty darn local! 1lb dried black beans (non-certified organic) If you’ve never used dried beans, the time is now! I’ve attached a website that gives good guidelines for cooking dried beans.http://whatscookingamerica.net/Vegetables/driedbeantip.htm I am a big fan of the pressure cooker and use it often. If you have a gift-giving occasion coming up, ask for a Pressure Cooker. You will love it! I cook dried beans without soaking in about one hour. U.S. Wellness, Monticello,MO http://www.grasslandbeef.com/StoreFront.bok (omnivores) This website is a great resource for cooking grass-fed beef and for poultry recipes. 1 package Chicken, Feta, Spinach Sausage links We think you’ll love these links. Eat them for breakfast, on a bun for dinner or cook and then cut up over pasta, rice or toss with the spaghetti squash. Yum. 1 container Cuban Beans or Cuban Bean Soup Del Carmen beans have an amazing flavor. She combines orange juice, beer and a variety of other spices into an exotic Cuban flavor. These are serve and eat, so it doesn’t get easier if you want a night off from cooking or an easy lunch. 1 pkg pesto A couple of months ago I cooked up a spaghetti squash and tossed it with Mangia Pesto. It was so tasty. This pesto is great mixed into eggs, tossed with pasta, mixed into mashed potatoes, or even as a condiment. 1 jar of applesauce Applesauce isn’t just for kids! See recipe below. You can also mix it in with your oatmeal or other hot cereal, mix with plain yogurt, serve on toast or on peanut butter. Also, great on pancakes! 1lb Bona Fide Espresso Goshen Coffee Company’s interpretation of a traditional Northern Italian espresso. Hints of berry, caramel, and Bakers Sweet Chocolate will leave a clean but distinctly sweet, lingering taste on your palette. This offering also makes a FANTASTIC drip coffee. Organic and Fair Trade. *Cook up a big batch of black beans and use throughout the week. When we want something easy and hearty, we eat beans and rice.When I don’t have fresh tomatoes, I’ll add a can of diced tomatoes, some sauteed onion and garlic, salt and pepper and some cumin. Top with cheese, scallions and salsa. It’s super easy and you can spice it differently each time. You can also use the beans for burritos, tacos and huevos rancheros. 1. In a large bowl, toss the cabbage with the wine, lemon juice and sugar. Let marinate for 1 hour, tossing often. 2. In a large deep skillet, heat the olive oil. Add the onion and cook over moderate heat until golden, about 8 minutes. Add the cabbage and its marinade and cook over moderately high heat, tossing, until wilted, about 5 minutes. Cover and cook over moderately low heat, stirring occasionally, until almost tender, about 20 minutes. Add the apples and toss well. Cover and cook, stirring occasionally, until the apples are just tender, about 10 minutes. Season with salt and pepper and serve. 1 Preheat oven to 375°F. Butter and flour an 8-in square baking pan, set aside. 2 Sift together the flour, baking soda, cinnamon, allspice, nutmeg, cloves, and salt. Set aside. 3 In an electric mixer, beat butter until light, add sugar and beat until fluffy. Add the eggs, one at a time, beating to incorporate after each addition. Add the vanilla and the applesauce and beat until smooth. 4 Mix in half of the dry ingredients. Just before they are blended, add the thinned yogurt (or buttermilk). Then mix in the rest of the dry ingredients, until completely incorporated. Do not over-mix. 5 Pour out the batter into your prepared cake pan. Place in the middle rack of the 375°F oven and bake for 25-30 minutes, until done. The cake should spring back to the touch, and a toothpick or thin skewer should come out clean after being inserted in various spots in the middle of the cake. Remove the cake from the oven. Let cool for 15 minutes. Then invert to cool completely on a rack.